“I believe the issues causing regional tensions will be discussed,” Geng said. To another question whether the issue of listing of Azhar would figure in the talks specially in the backdrop of Chinese Ambassador to India Luo Zhaohui expressing confidence that it would be resolved, Geng said, “well I can’t prejudge the topics” that are going figure in the talks. “But they will discuss issues of bilateral, regional and international issues of mutual concern,” he said. Regarding the listing of Azhar, “China will continue to deal with the issue with a responsible and constructive manner and will maintain close communication with all parties, including India and Pakistan,” he said. According to reports in the Pakistani media, Qureshi, who is on a three-day visit to China, will hold comprehensive discussions on the entire range of bilateral relations, including the China-Pakistan Economic Corridor (CPEC). Qureshi will also address the Political Parties Forum on the CPEC and participate in the ruling parties’ dialogue between the Pakistan Tehreek-i-Insaf and the Communist Party of China. He will also call on the Chinese leadership, the reports said. 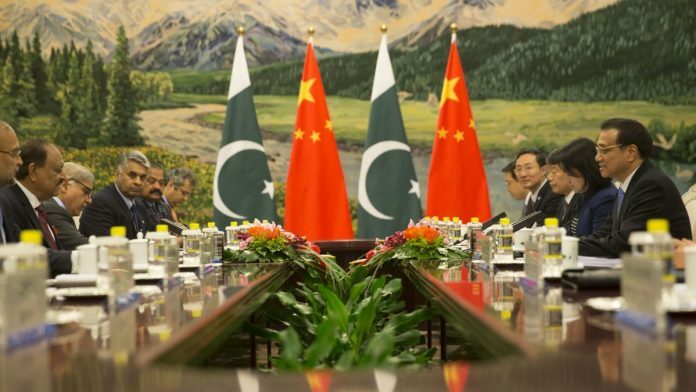 The CPEC, which connects Gwadar Port in Balochistan with China’s Xinjiang province, is the flagship project of Chinese President Xi Jinping’s ambitious Belt and Road Initiative (BRI). India is opposed to the project as it passes through Pakistan-occupied Kashmir.